Title text: We've also developed the semi-semi-log scale, where the Y-axis for the left half of the graph is a log scale but on the right half it isn't. Careful! You'll give them ideas! I mean, it could be worse. At least the horizontal grid lines are not diagonal. keldor wrote: I mean, it could be worse. At least the horizontal grid lines are not diagonal. The vertical ones, you mean, that are spread horizontally? Last edited by keldor on Mon Jul 23, 2018 5:51 pm UTC, edited 2 times in total. I am sooooo going to start using the semi-semi-log graph, just to see if anyone at work is paying attention to my reports. Fun True Fact: in high school AlgebraII/preCalc, I once hand-drew (this was long before fancy toys like calculators or desktop computers existed) a graph of y = 2*x that looked like a parabola, thanks to my careful placement of values on the x-axis. The teacher liked it. 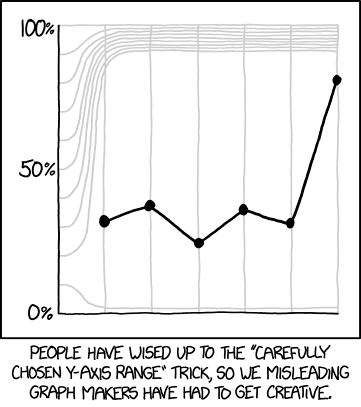 So... uh, have people (in general) really "wised up" to misleading graphs? Those can actually be useful. I could actually see the semi-semi log graph, adequately labeled, as being useful for some things, where you're tracking something that's exponential over time, but you need more detail in the present. Of course, you could also just add a second graph. Personally, I think the best thing to do would be to put the important information on the Z-axis, but keep the viewing angle straight dead-on with the X-Y plane. Carteeg_Struve wrote: Personally, I think the best thing to do would be to put the important information on the Z-axis, but keep the viewing angle straight dead-on with the X-Y plane. See, this is an arguement for everyone to have a VR headset. Yeah, well, I'm gonna put my data on the 8th dimension! You won't be able to get to it without Buckaroo's help. cellocgw wrote: I am sooooo going to start using the semi-semi-log graph, just to see if anyone at work is paying attention to my reports. Wait, what?! ...how? Sure, getting one half or the other parabolic is a simple task of writing the x-axis with square values (1, 2, 4, 9, 16...), but if you've got both positives and negatives in there, the dang thing's gonna look more like a cubic. It could be more misleading. The vertical lines could be error bars, zoomed in too close to see where they start and end. DanD wrote: I could actually see the semi-semi log graph, adequately labeled, as being useful for some things, where you're tracking something that's exponential over time, but you need more detail in the present. Of course, you could also just add a second graph. It's perfectly OK to have split scales: for example, the ITU propagation curves in figure 1a of ITU-R Rec P.370-7 have a horizontal (distance) axis that is logarithmic for shorter distances (the left part) and linear for longer distances (the right part). The grid lines are still vertical and horizontal, though. However, what the title text proposes is the the vertical axis is different on the left and right. (This just seems to me a special case of the non-horizontal gridlines of the comic). I am familiar with the hilarity of misleading graphs, but it seems to me that this is another case where Mr. Munroe accidentally uploaded an incomplete comic again. The black line here just seems to have no correlation to the rest of the figure. I think the black line having no correlation to anything is the point. It just jiggles up and down slightly, randomly, because of noisy data, like most lines tend to do. But because of the distorted scales, it looks like there's is a sharp upward trend recently. That latest point looks like 80%, but actually all of the points are between 10% and 20%. Jorpho wrote: I am familiar with the hilarity of misleading graphs, but it seems to me that this is another case where Mr. Munroe accidentally uploaded an incomplete comic again. The black line here just seems to have no correlation to the rest of the figure. The point is that the six datum points all lie within the 10% to 20% vertical slice (that is rendered non-linear, although not actually so non-linear that you can notice. I'd be interested to see someplausibld unit-percentage lines mapped over that, to show where the warping of the verticality kicks in and out from. By visual inspection (can't even count pixels), if we assume the space between the two lines is 'flat' as far as 11% to 19% then the points marked are maybe 13, 14, 12.5, 14, 13 and 19. (This is likely not quite true and the first point may be as much, or more, than the last one when the inter-decade interpolation is correctly imagined.) Depending upon the data, a change from low-to-mid teen percentages to a high-teen percentage could still indicate a developing problem (I still think the first value is going to be higher-teens, for a "U"-curve that wouldn't be as scary on a less esoteric, yet otherwise dishonest, graph). But it is remapped to look like a sub-50% chance, uncharacteristically to the rest of the mildly changing data, suddenly jumps to half-as-much-again on the last swing (rather than maybe/maybe-not slightly blipping). And a simple glance at the Y-Axis while overlooking the faded Y-Axis lines might catch out those who were at least aware that the Y scale might be labelled as a subset of the percentage line (consistently!) to try to show variations that are not so outstanding (or, indeed, visible) on a proper zero-grounded and 100%-topped graph with both innocent and misrepresentive reasons being possible reasons behind the utilitarian subset. This graph, though, just messes with you in that regard. What someone needs to do is to plot pixel-locations for where the decade lines vertically cross X-displacements, find out what sort of evolving distortion pattern might have been applied and plug back into that conneptual sweep-changing distortion the lesser percentage values (units, maybd tenths, maybe even hundredths) to draw in the 'tighter' lines within that decade. I imagine Randall didn't just draw freehand lines, but calculated something in an actual graphing program and used that to inform his digital 'freehand' form. The complication is that the lines 20% on upwards seem to be set linearly (within the shakeyness of a drawibing hand upon a drawing stylus) and the lower line has only a measurable relationship with the 0% line that is also the X-Axis, and it may be intended to be a similar gap. But we don't see an obvious transitional 'pixels per percentage' change between such lines (on any given x-vertical), it must all happen within the 10-20% space. But it'd be (plotting some sort of pixels-per-percentage against the percentage, on any particular vertical) probably something like a Sugerloaf Mountain curve with the hump always contained within the decade of concern. Swept out as a surface to represent its changing nature across the verticals, it'd probably be like a thin vertigal wedge (or rounded block) arising up out of a falling slope. I imagine. But there may well be other forumlae and topographies that fit nicely within the known inflections. You've never seen the whole parabola in your entire life. This might have just been a case where all the graphed points were on one side of the vertex. gmalivuk wrote: You've never seen the whole parabola in your entire life. What if the X axis is dynamically scaled to limit to ±∞ at the margins of the plot. Then you just need to worry about how to scale the Y to have (at least!) +∞ no further than the top edge, to see the entire curve. True, but because of how asymptotes do, I've seen enough of thousands (maybe tens of thousands) of them. Plus the equation's given as y=2x, that means west of 0, that curve's headed south, making for a look much more like that of a cubic. Unless of course, as posited by the clause "but if you've got both positives and negatives in there", it is in fact only graphed on the eastern flank, as you also suggest. Since all parabolas are similar, if you've seen one you've seen 'em all. I said "the whole parabola" as reference to the fact that there's effectively just the one, but you've never seen all of that one. gmalivuk wrote: I said "the whole parabola" as reference to the fact that there's effectively just the one, but you've never seen all of that one. Well, you can plot the arctangents to x and y, to see the whole of any function. The arctangent function conveniently maps all of the real interval to a convenient finite interval that fits on paper. Being strictly increasing, the distortion is low at the center.